One of the biggest hurdles that individuals face when coming to grips with whether or not to file for bankruptcy is the feeling that they are all alone and that no one has ever gone through what they are going through before. The stark reality is that hundreds of thousands of people each year have to file for bankruptcy. Therefore, we have created these case studies of similar situations that people face so that you will have an understanding that you are not alone in your situation and that bankruptcy can offer you a new beginning. One typical situation we have is as follows: A young couple between the ages of 25-30 who are married with one child. They currently rent and have two car payments. While they both worked when they were first married, after having their first child, the wife was unable to find a high enough paying full-time job to cover childcare and have extra money to bring home. Therefore, to make ends meet, they relied more and more on credit cards. The husband makes $25,000 a year. They then became late on making credit card payments and had the interest rates increased by the credit card companies to over 25% to where they could not even make the minimum payments. They decided to just ignore the credit cards, the phone calls from collection agencies and the letters from attorneys until they were served with a credit card collection lawsuit. They then made an appointment to see us. Since then have a gross annual income of under $42,000 (which is the current approximate mean income for Florida residents), they qualify for a Chapter 7. Additionally, since they do not own a home, they can each claim a $5,000 exemption towards their personal property and a $1,000 exemption each toward equity in their vehicles for total exempt assets of $12,000. Since in this case their vehicles are upside down, (meaning they owe more than what the vehicles are worth) but they can continue to afford the payments, they will be able to keep their vehicles. 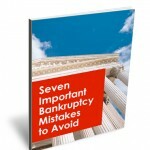 Since they can file a Chapter 7, they will receive their Discharge in 6 months, be relieved from the credit card debt, and get a fresh start while being able to keep their vehicles and their apartment and should be able to make ends meet since they have been relieved of their $25,000 in credit card debt. Another typical example of clients who come to see us is a couple between 45-50 years old. They may have purchased a house in 2005-2006, at the top of the market, and now are over $100,000 upside down on their house. 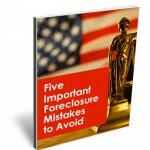 They may have also purchased an investment condo or a vacant lot which was foreclosed on, and they face a $75,000 deficiency judgment. At the time when they purchased these properties, the wife was a realtor making over $100,000 a year and the husband had his own contracting business making $150,000 a year. However, in the last 12 months, they have had a car and boat repossessed and are now facing $30,000 in deficiencies on those two items as well as ran-up credit card debt of $40,000 to survive. The wife’s annual income has been reduced to around $20,000 a year and the husband has closed his business and is working at a local hardware store part time making about $18,000. While they do not want to keep their home, they do have about $3,000 in non-exempt assets. They also make under the $42,000 threshold for qualifying for a Chapter 7 and therefore, may proceed under a Chapter 7 filing. For these clients, all of the credit card debt can be discharged as well as the deficiencies on the real estate and the car and boat that were repossessed thereby, being relieving them of over $245,000 worth of debt. However, since they have $3,000 in non-exempt assets, they would either have to turnover $3,000 worth of assets to the Trustee or, they can buy it back from the Trustee usually over 12 months’ time by making payments of $250 a month. Again, in 6 months they will receive their Discharge and have a fresh start, relief from their debt, relief from stress in the relationship caused by the debt, and they can begin to make a new life. The third typical couple we see is a retired couple who may have relocated here from someplace up North, and purchased their home before the real estate bubble. However, during the bubble, when they had a great increase in the equity of their home, they pulled out the equity through a second mortgage in order to use as a down payment on an R.V., and then to help out their children who were struggling up North due to the loss of jobs. Additionally, they had grown accustomed to a certain lifestyle while they were working and attempted to continue that lifestyle once they retired without properly planning their expenses based upon their retirement savings. Their income is usually from social security and a small pension of a few hundred dollars. Eventually, they spent down their 401-K from a couple hundred thousand dollars to maybe $10,000 remaining, and began living on credit cards running them up to $50,000. They then come to see me after the R.V. has been repossessed and they are getting calls from credit card companies. Also, often it is the children up North contacting me once they realize the situation their parents are in after their parents have been telling them that “everything is fine”. Typically they will have a paid-off car in good condition as well as significant personal property. In this typical scenario where they also want to keep their home, their exemptions are very limited to basically $2,000 worth of personal property and $2,000 in equity in a vehicle. Therefore, often older couples we see have significant non-exempt assets that either have to be turned over to a Trustee or purchased back from the Trustee. While their Social Security income is exempt in determining what their annual income is for purposes of whether or not they qualify for a Chapter 7, even though they may qualify for a Chapter 7, we have to file a Chapter 13 so they may keep their non-exempt assets. In this example, if the clients have $18,000 worth of non-exempt assets, they can file a Chapter 13 which would allow them to keep all of their assets and their vehicle by making payments of $300 a month over 60 months and, at the end of the 60 months, they will receive their Discharge. In this example, if they are getting relief from $50,000 worth of debt and a $50,000 deficiency judgment on their R.V., they are getting a fresh start by paying just 18¢ on the dollar for their debts, stopping the creditors from harassing them, and being in a position to have an affordable payment and enjoying the rest of their retirement. These three case studies are examples of the typical clients that we see and are not meant to represent any particular client. Should you have any questions, please do not hesitate to contact us for a free bankruptcy consultation at 941-206-3700 or by e-mailing me at mark@martelllaw.com.